THE disappearance of Chief Cook Cesar Llanto from the ship Sage Sagittarius was treated as an "alleged murder" not an accident or a suicide, according to a key Australian Federal Police officer. 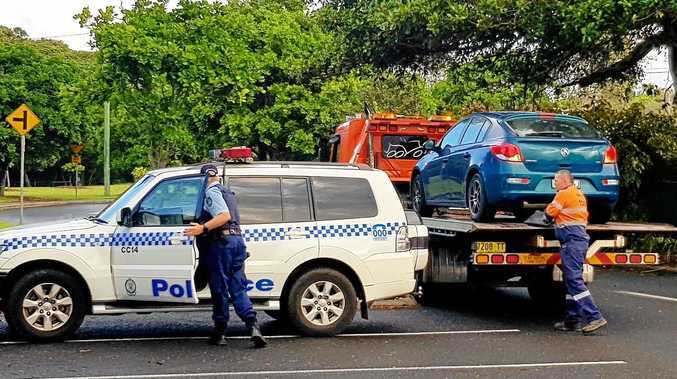 Detective Sergeant Nuckhley Succar was the case officer for the investigation into how the chief cook vanished from the ship on August 30, 2012 as it travelled along the Queensland coast. Speaking to the Coroner's Court in Sydney, Det Sgt Succar was questioned about his opinion on the crewman's death, which prompted a massive air and sea search. He was asked if he believed Mr Llanto "accidentally fell off the ship". "I wouldn't say it was an accident," Det Sgt Succar said. "I think it was highly suspicious." The AFP officer was then asked if he believed Mr Llanto had taken his own life. Det Sgt Succar said his opinion was based on having interviewed crew members, read the forensic reports and having viewed other evidence. He said by the time he and the AFP's investigative team met with ship owners NYK Line less than a week after Mr Llanto's disappearance, police were looking into an alleged murder. The Australian Federal Police was not able to board the Sagittarius until September 7 when the ship reached Port Kembla. That was the day Chief Engineer Hector Collado would be struck on the skull and fall to his death. Det Sgt Succar said there was concerns about the contamination of evidence. Two company staff members arrived on board on September 3, Safety Superintendent Kosaku Monji and a colleague, flanked by security officers. Det Sgt Succar he believed Mr Monji and Sagittarius Captain Venancio Salas Jr had worked together to collect statements from the entire crew, which were then handed to AFP investigators. Was the engineer pulled to his death? BLOOD evidence recovered from the storeroom where Chief Engineer Hector Collado, 57, did not rule out the risk of foul play aboard the Sage Sagittarius, according to a forensics expert. New South Wales forensics officer Detective Sergeant Shawn Harkins told the Coronial Inquest into deaths aboard the Sagittarius that seemingly undisturbed blood drops left by the engineer's injury did not mean his death was accidental. Det Sgt Harkins had previously told the inquest the blood evidence did not necessarily show evidence of an attack. Lawyer David Dalton, who represents the International Transport Workers Federation, put a hypothetical situation to the expert, which involved the slain engineer being struck, then guided to and over the railing to his death. If the engineer was struck just once by an attacker, Mr Dalton asked, and the attacker guided the now injured engineer backwards towards a railing, was there evidence to dispute it? "Mr Collado could have been cantilevered over the railing with the assailant staying to the left?" Det Sgt Harkins said the evidence did not go against the scenario. The evidence, he said, showed Mr Collado was "upright and bleeding" and moving towards the railing. There was no evidence of a struggle inside the room. Mr Collado's smeared blood on a high railing before falling more than 10m to his death. He was the second of three men to die aboard the Sagittarius between August 30 and October 6. "Death Ship" inquest to consider blood and police evidence. AUSTRALIA'S most notorious maritime mystery will again be put under the glare of the courts, as a coronial inquest considers how two Filipino seafarers came to die aboard a Japanese ship in coastal waters. The Sage Sagittarius was dubbed the "death ship" after its Chief Cook Cesar Llanto disappeared from the ship as it travelled south along the Queensland coastline on August 30, 2012. Just two weeks later, Chief Engineer Hector Collado would be hit on the head by an unknown object, then fall more than 10m to his death in the moments before the ship reached the Port of Newcastle. The inquest under New South Wales coroner Sharon Freund was announced following a major investigation by Australian Regional Media unearthed allegations of abuse and gun-running on board. The ship's captain at the time - Captain Venancio Salas Jr - has admitted under questioning that he illegally sold guns to crew members on board. He also conceded that he had physically assaulted a young, gay crewman. Captain Salas has denied any involvement with the deaths that occurred on the Sagittarius. Capt Salas has now arrived in the Port of Gladstone aboard a new ship, on the same day the inquest is considering how two men died aboard his former vessel. When the Sagittarius arrived at a Japanese port after leaving Australia, another man would die. Japanese safety superintendent Kosaku Monji was put on the Sagittarius while it was in Australia in an effort to comfort and potentially protect the crew. In early October, he would be crushed to death in the Sagittarius's conveyor belt machinery. Because the death occurred outside Australia, this fatality is considered widely outside the consideration of the coroner. The inquest is expected to hear more evidence considering the blood trails left by the chief engineer at the time of his death. Officers from the Australian Federal Police are also likely to face cross-examination. The inquest is due to run until Friday.